BankTrack – Who’s banking the Coastal GasLink pipeline? On January 7, 2019, the Royal Canadian Mounted Police trespassed on the land of the Wet’suwet’en people and arrested 14 land defenders in heavily militarized fashion, following the orders of fossil fuel behemoth TransCanada. The militarized police were enforcing an injunction from the British Columbia Supreme Court to clear a road on which members of two clans of the Wet’suwet’en Nation — the Gilseyhu (Unist’ot’en) and Gitdumden — were peacefully occupying their land. This land is unceded, as the Canadian Supreme Court recognized in the landmark 1997 Delamuukgw decision. TransCanada was granted an interim injunction to start pre-construction on the Coastal GasLink fracked gas pipeline, even though the company does not have the free, prior, and informed consent of the Wet’suwet’en people to build it. Five hereditary chiefs whose traditional territory is on the proposed route oppose the project. 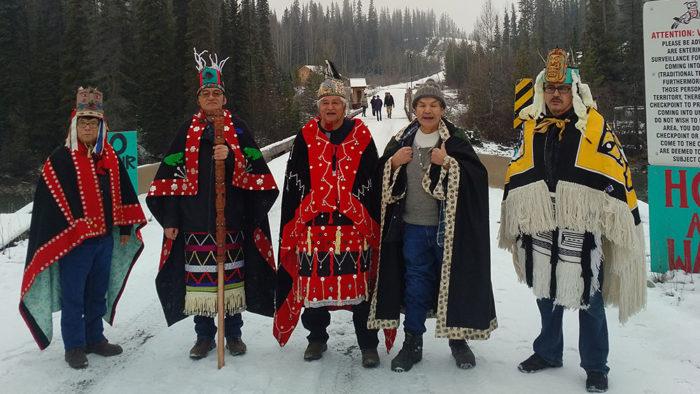 All five hereditary chiefs of Wet’suwet’en Nation stand in opposition to the project. The banks supporting the Coastal GasLink pipeline are contributing to this clear abuse of Indigenous rights, even though many of them have stated policies acknowledging the right to free, prior, and informed consent of Indigenous communities. Coastal GasLink is a project of TransCanada Pipelines Ltd., the same subsidiary of TransCanada behind the controversial Keystone XL tar sands pipeline. The 420-mile Coastal GasLink pipeline would carry fracked gas from northeast British Columbia to LNG Canada, a massive proposed liquefied natural gas (LNG) terminal that exemplifies the sector’s climate and human rights impacts. Coastal GasLink is estimated to cost about US$4.5 billion, so how is TransCanada funding the project? Currently, the pipeline has no project-specific finance. Instead, it is being supported by the banks that have extended general corporate loans to TransCanada Pipelines Ltd. (including two loans signed as recently as December 2018), underwritten bonds issued by the company, and facilitated the sale of company assets. JPMorgan Chase is the #1 backer of TransCanada Pipelines Ltd., and therefore of the Coastal GasLink pipeline. JPMorgan Chase is the lead agent on the majority of the company’s loans. TransCanada Pipelines Ltd. currently has four loans worth a total of about $9.8 billion. Two of those, totaling $5.5 billion, were signed in December 2018 and increased the subsidiary’s available credit by two thirds. (We recently wrote up the details of those transactions.) JPMorgan Chase was the lead agent — the bank responsible for arranging the deal and coordinating between TransCanada and its lenders — on both of those new loans. That makes it the lead agent on more than half of TransCanada Pipeline Ltd.’s current credit. It’s also a lender to the company’s other two lines of credit. JPMorgan Chase is one of two key bond underwriters. TransCanada Pipelines Ltd. issued nine bonds, totaling $9.3 billion, in 2018. JPMorgan Chase was a lead manager — one of two banks directing the bond sale — on eight of those nine transactions. This makes JPMorgan Chase the #1 banker of TransCanada Pipelines Ltd., and therefore of Coastal GasLink pipeline, despite an Environmental and Social Policy(see p. 17) that expects clients to obtain free, prior and informed consent of Indigenous Peoples. Bank of Montreal is the lead agent on two older loans to TransCanada Pipelines Ltd. that add up to about $4.3 billion. It’s also a lender to the two new loans and participated in one 2018 bond sale. Deutsche Bank was the other lead manager, alongside JPMorgan Chase, on eight bonds (worth approximately $8.7 billion) that TransCanada Pipelines Ltd. issued in 2018. The German bank was also a lender to all four current loans. The Canadian Imperial Bank of Commerce was the sole manager on one of the nine bonds issued by TransCanada Pipelines Ltd. in 2018, as well as a lender to all four current loans. The Canadian bank also advised TransCanada on a November 2018 deal that sums up TransCanada’s backwards direction: the sale of its stake in wind energy facilities in Quebec, to the tune of $630 million, in order to fund Coastal GasLink pre-development costs. The Wet’suwet’en have made it clear that the fight is not over. We demand that these banks cut their ties with TransCanada, as the company tramples on Indigenous rights in order to ram through the dangerous pipeline. The world is watching — hundreds of solidarity actions are taking place across Canada and around the world — and RAN and allies will continue to pressure these banks to stop supporting Indigenous rights abuses. 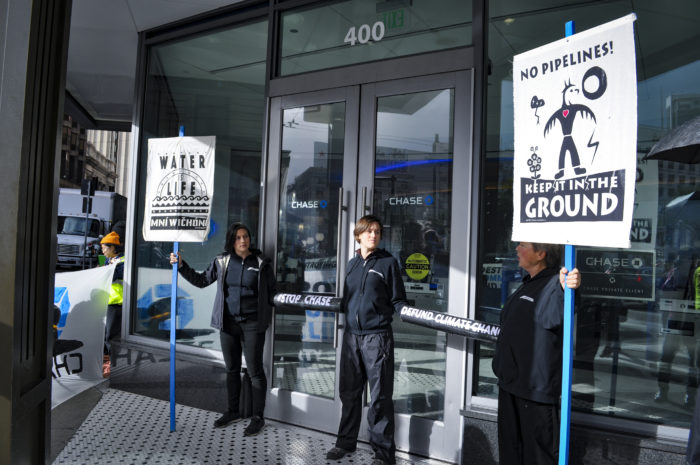 Rainforest Action Network shuts down a Chase Bank branch in San Francisco. Data source: Bloomberg Finance L.P. All monetary values in USD. * This list may not include every bank that is a lender to TransCanada Pipelines Ltd., as the full lender lists are not disclosed on all four active loans. Donate: We encourage everyone to support the Wet’suwet’en by donating to the Unist’ot’en Camp Legal Fund to support the Wet’suwet’en’s legal response, to the Unist’ot’en Camp, and to the Wet’suwet’en Access Point on Gidimt’en Territory. Take action: Actions and events in support are continuing. Find one near you, or organize one in accordance with the action protocols by joining the “We Support the Unist’ot’en and the Wet’suwet’en Grassroots Movement” Facebook group. For more resources, check out the Wet’suwet’en Strong: Supporter Toolkit. Send an email: Send an email directly to the provincial government of British Columbia and the federal government of Canada to respect the rights, jurisdiction, and laws of the Wet’suwet’en on their unceded territories. Flood the phone lines: Take one minute to call relevant politicians and demand that the Canadian government revoke this fracked gas pipeline and respect Wet’suwet’en jurisdiction. The following links connect you directly to their phone lines and provide sample scripts: click here to call British Columbia ministers and here for federal ministers. Join RAN’s Year of Climate Action: Sign up to join our monthly actions to pressure JPMorgan Chase and other institutions to stop financing climate change.